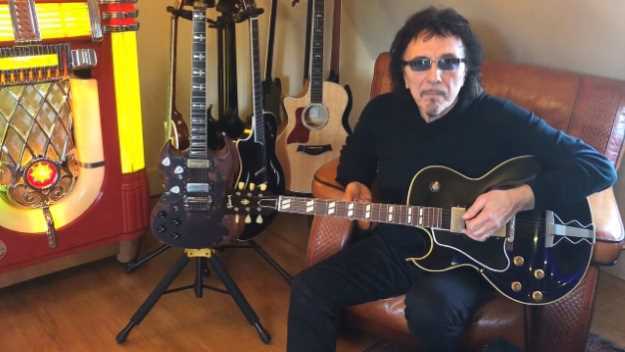 Tony Iommi says that he has begun remixing BLACK SABBATH's 1995 album "Forbidden" for a 2019 release. The LP, which features singer Tony Martin, drummer Cozy Powell and bassist Neil Murray, is often regarded as the band's worst studio recording. "Next year will be the 'Forbidden' album coming out, which we're remixing at the moment - [engineer] Mike Exeter an myself," Tony said in a video message posted to his Facebook page on Saturday (December 29). "And it's been interesting to pull that apart and at least try and get some bigger sounds on it, as it should be. I know Cozy was never happy with his drum sound, and none of us were really happy with the sound of that album. So hopefully now it will be sounding better." BLACK SABBATH started working on "Forbidden" in Par Street Studios in Liverpool, England in 1994 and completed most of the recording sessions over a 10-day period at Devonshire Studios in Los Angeles with producer and BODY COUNT guitarist Ernie C. The LP's opening track, "The Illusion Of Power", features a guest appearance by BODY COUNT frontman Ice-T. In a 2011 interview with Gibson.com, Martin stated about "Forbidden": "Well, 'Forbidden' is I want to say 'crap,' but it's actually not. The songs worked really well in rehearsals, and then things started to get political, and I got wind of an Ozzy [Osbourne] reunion [with SABBATH] - not from SABBATH directly, of course. But before that came, there was a meeting at the SABBATH offices in London to which we were summoned to discuss the possibility of doing a RUN-D.M.C. type of album. I thought it wouldn't work, and voiced that. Cozy Powell thought it wouldn't work. I was never sure that most of the others were convinced, but we were kinda steered into a 'rap SABBATH' album. Then I was told that Ice-T was gonna be doing it and they couldn't or wouldn't tell me if he was doing the whole thing or just one track... and I still didn't know the answer to that when I was in the studio singing the tracks. They said they were gonna take it and see what Ice-T wanted to do. So it has a distinct ill feeling about it. The album eventually didn't really work, although some fans love it. And it was the penultimate album to my being removed from the band, the last album to be released being 'Sabbath Stones', a compilation album, which kept my name in the band to span 10 years and six albums."